When I saw the opening of The Hanoi Bike Shop mentioned on the 5pm blog, I was pretty damn excited. I love Vietnamese food, and really missed it since moving from Melbourne to Glasgow. Just a couple of months ago, I resorted to made Bahn Mi - Vietnamese rolls - at home (they were amazing, by the way). I'm so happy I can now buy them in Glasgow. We headed there on Saturday - they only opened on Thursday. Now, I've been to a lot of places when they have just opened, but I honestly wouldn't have been able to tell - service was friendly and enthusiastic and the place looks great. We started with a couple of beers - Hanoi, and Saigon. Personally I loved the Saigon but it was lunchtime so just stuck to one beer. Then to make the decision on food - the menu isn't huge, but I still had a lot of trouble deciding what to get. I really wanted to try the Pho but couldn't go past the Banh Mi this time. We also got some rice paper rolls and the Dia Dung Com as a side - Vietnamese sausage with picked vegetables and bread. Both these dishes were great. The Vietnamese sausage was really tasty, and I loved that the pickled vegetables were served in their own little jar. Every dish came with lashings of coriander - probably my favourite herb so I was in heaven. 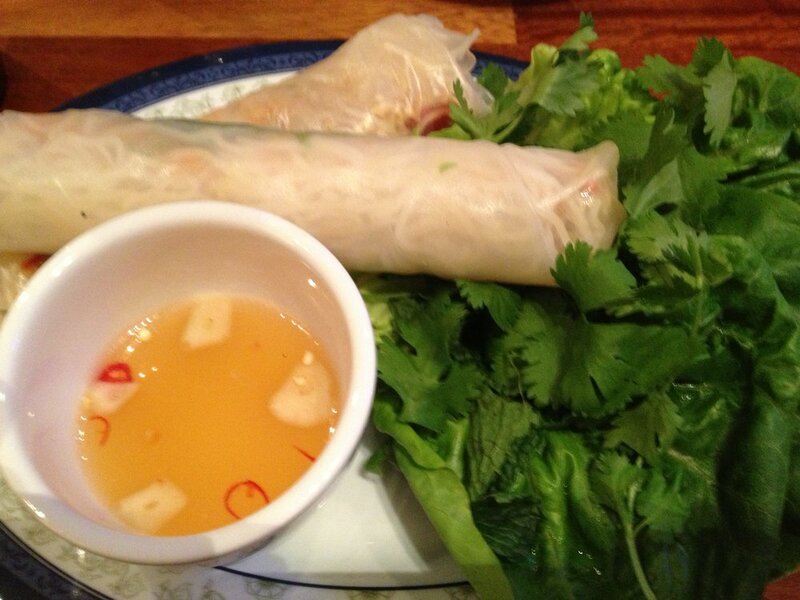 The rice paper rolls were packed with filling and went perfectly with the dipping sauce. There is one thing I haven't yet mentioned which made me love this place even more. On all the tables they have a little squeezy bottle of sriracha. This is my new all-time favourite spicy sauce and I make it at home. I covered everything I ate with this to give it an extra kick. On to the Banh Mi! Wow is pretty much all I had to say - these were great. I tried both and loved them - the pork has a sweetness to it whereas the beef was definitely more savoury/umami. They were absolutely chok-full of ingredients but were easy to eat once you jammed everything in there. A Banh Mi can really have any mix of ingredients but I would say it is essential to have lettuce, coriander, pickled vegetables and some kind of protein (whether it be meat or tofu). The only one tiny thing I would ask for next time is for mayonnaise on my roll as that is my personal preference! We had a great time visiting The Hanoi Bike Shop - and I would have loved to stay on longer but we had places to be (visiting the National Museum of Roller Derby exhibition called The Revolution on Roller Skates!). I can't wait back to try the Pho and some of the other dishes on the menu that we saw neighbouring tables eating. This place has definitely brought something new and interesting to Glasgow, and is high up on my new favourite places to eat.